At this time the only documented villain hero firearm to be released by Bapty Ltd. into the hands of collectors is the pistol used by Lao Che's son, Chen (Chua Kah Joo). It is first seen in a smoking close up as Wo Han (David Yep), Indy's accomplice is shot during the cork popping scene in Club Obi Wan. 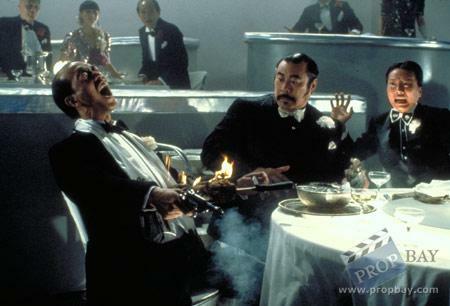 We next see it being fired on screen when Indy spears Chen with the flaming pigeon flambé. The pistol in question is actually a Webley and Scott Mk. 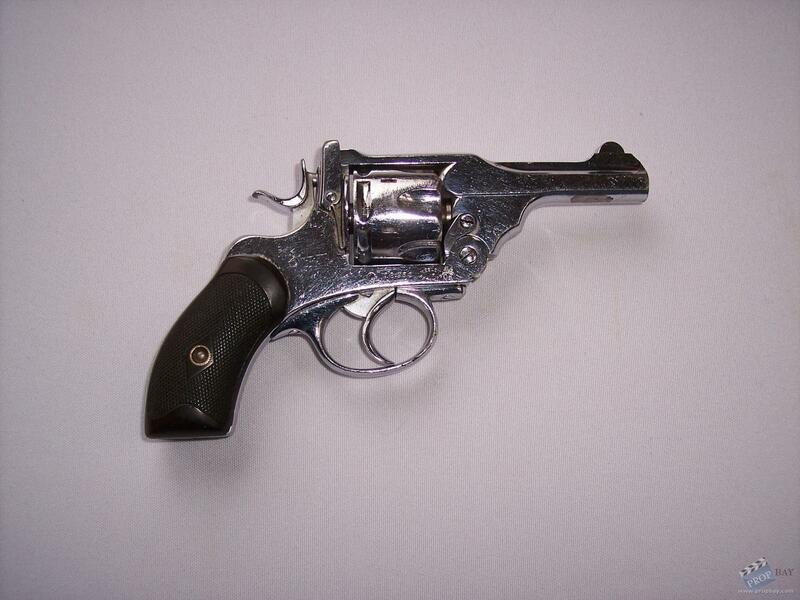 III Commercial Contract Pocket Revolver produced between 1896 and 1927. Issued in .38 cal. 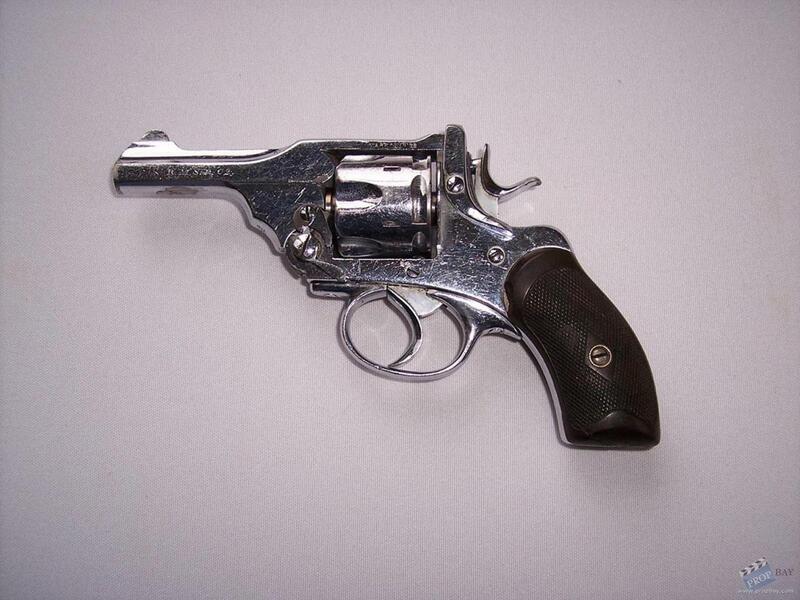 S & W and nickel plated, this model was primarily used by British Police and government agencies. Our hero weapon has engraved on the barrel "R.M.S.P.Co. "; which stands for Royal Mail Steamship Packet Co. and saw service with them as a side arm for senior officers aboard ship to about 1932 before finding its way into the movie industry. Serial Numbered 18952, with all numbers matching, the revolver was deactivated by The London Proof House under the British Firearms Act of 1988 before it was released by Bapty Ltd. in 2006. The grips are of dark brown bakelite. While there were other villain hero guns used in the first three Indy pictures, a portion of the records on Bapty rentals giving provenance to many of their firearms have been lost making verification almost impossible. Warehouse 53 Museum of Adventures in the Cinema was created in 2008 to feature screen-used props, costumes and production material of films and shows fitting into the Treasure Hunt / Archaeological, Space and Pirate adventure genres. Currently the collection contains well over 2,000 items and is steadily growing. The Museum plans to find a physical home to display the collection to the public in the near future. Added: 08-18-2018 - Viewed: 375 times.